This two-story project, abutting the existing Education Center at VSU, provides the university with two large capacity lecture halls at 360 students each. In addition to the lecture halls, a study alcove, rest rooms, and support services are included in the program. The main entrance includes an elevator and monumental stair enclosed in a glass box, providing natural light and a rich experience for the occupants entering the building. The exterior aesthetic of the project fits within the context of the existing 1970s post-tensioned structure, mimicking elements such as shadow boxes, control joints, and stucco. The sloped floor lecture halls have exposed ceilings and fixed seating. An acoustical consultant was utilized to provide a state-of-the-art audio/visual system and acoustical wall treatment. IPG provided architectural design for a new 21,000 SF, 2-story collegiate laboratory science building. The new construction is comprised of (8) instructional spaces including: (2) general biology labs; (1) microbiology lab; (1) anatomy and physiology lab; (1) general chemistry lab; (1) organic chemistry lab; and (1) tissue culture lab. The building components, especially exterior brick and cast stone materials, are intended to solidify campus standards, draw references to existing historic precedent, and help establish the visual aesthetic for projects. Interior finishes are in the warm organic color range, and have been selected to be durable enough to withstand heavy class scheduling. IPG provided pre-design and design services for the new 35,000 square foot Larry J. "Butch" Parrish Technology Center. The new facility includes offices, classrooms, industrial labs, and computer labs needed to support economic development and technical education programs. IPG was the associate architect for this $10.9m addition to the original library, which was designed by IPG around 1972. The original facility includes 87,230 SF and houses stacks for 387,692 volumes. This addition is approximately 94,000 SF and includes additional collections, offices, and classrooms with ancillary support services. A 24-hour internet cafe supports technology access and studying resources for VSU students. Additional elements of the facility include a computer lab, Georgia Library Learning Online (GALILEO) Technology Center, reading rooms, expanded study space, 100-seat auditorium, new book stacks, media services, increased multimedia and digital editing, archives (triple in size), and special climate controlled areas for rare books. IPG was selected to provide pre-design and design services for Southwest Georgia Technical College's new Classroom/Student Services/Administrative Building. This 54,000 SF facility houses four instructional departments, enhanced student services, and administrative functions which include: Business and Computer Technology, Developmental Studies, and General Education. Classroom and lab areas are planned for the future expansion of each program and will accommodate new programs. The project was constructed through a Construction Management at Risk process. Project TCSG-246 for Moultrie Technical College is a new 45,000 SF, two-story Health Sciences Building. 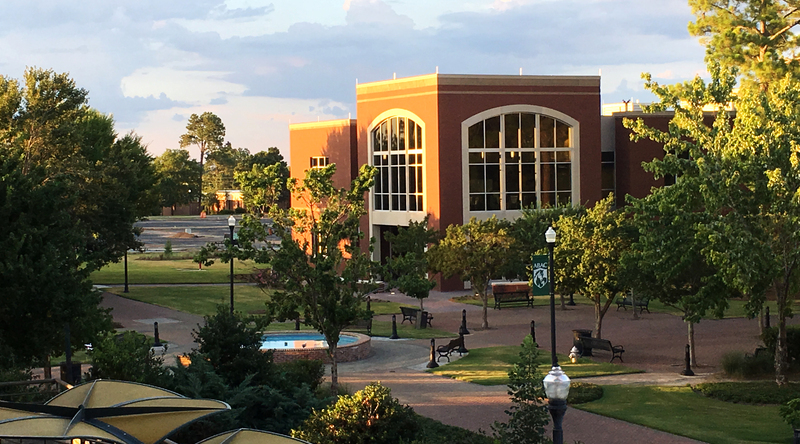 Designed to maintain and compliment the established language of the campus, the typical exterior wall construction utilizes brick veneer over cold-formed metal framing to create the brick arches central to the existing aesthetic. Aluminum composite material wall panels and dry-stacked stone veneer accents add variety and interest to the facade. Roof construction also conforms to the campus language using sloped standing seam metal roof panels. The new facility will house classrooms and labs for various Health Sciences programs including Medical Assisting, EMT/Paramedic Technology, Practical Nursing, Radiologic Technology, Patient Care, and Neuromuscular Therapy. The design also provides indoor and outdoor student gathering spaces and a landscaped pedestrian plaza with covered walkway that ties the major campus buildings together. Site improvements include new student parking centrally located to serve several buildings and a new dedicated loop connector road that improves traffic circulation and provides access to future building sites on undeveloped portions of the campus. The project bid approximately 4 percent under budget. Designed as the first building for Coastal Pines Technical College’s new campus in Brunswick, Georgia. This 54,938 square foot, two-story building sits on 35+ acres of land in the Brunswick-McBride Industrial Park. This new facility will serve and provide spaces for the college’s general and specialized education, health science, and truck driving programs. The main 2 story building is located on undeveloped parcel of land with an existing lagoon. The Golden Isles Career Academy sits on 13 acres to the East, adjacent to the project. To the East of the main facility lies the CDL facility which includes a Classroom Office Facility, Driving range and Driving Pad. This project was completed using the CM @ Risk delivery method.